Will history repeat itself? The USDA appears to be headed back toward costly animal ID that could put small-scale producers out of business. Eleven years ago, a group of farmers and ranchers founded FARFA to fight a massive over-reaching industry-government program called the National Animal Identification System (NAIS). NAIS would have required everyone who owned so much as a single livestock or poultry animal to register their property, tag their animal (in most cases using electronic forms of ID), and register their movements with a database. There were fees and costs associated with every step, and the combination of the expense and the time burdens would have driven most small livestock producers out of business and hobbyists out of a hobby. NAIS was developed during the 1990s by a coalition of large agribusiness companies and associations, high tech companies, and USDA. In mid-2000, USDA launched the program, with plans to have the full system in place and mandatory nationwide by January 2009. Instead, USDA faced a firestorm of protests from organic farmers, independent ranchers, horse owners, property rights advocates, and more. A hundred organizations from widely disparate points on the political spectrum signed our organizational sign-on letters at various times (see, e.g. this letter to then-Secretary of Agriculture Tom Vilsack), and thousands of individuals called, wrote, and protested at their state Capitols. Thanks to the organized grassroots outcry, Secretary Vilsack withdrew the plans for NAIS in 2010. At the same time, he announced plans for a replacement program, to be called the Animal Disease Traceability (ADT) program. We spent the next two years fighting to ensure that USDA kept its commitment to make ADT a reasonable, cost-effective plan. In 2012, USDA issued the ADT rule. It covered inter-state movements only, requiring that cattle and poultry that crossed state lines were identified. Traditional, low-tech forms of ID were expressly allowed, and several exemptions that we had fought for were included. Read an overview of ADT. Among other things, the final ADT rule dropped the proposed requirements for “feeder cattle” – beef cattle younger than 18 months of age. The USDA explicitly stated that it would revisit the issue of feeder cattle in the future, allowing a focused discussion on the specific problems posed by identifying younger animals in a separate discussion. So when USDA posted a notice for a series of meetings to discuss ADT this spring, it was not a major surprise – we had known that, sooner or later, there would need to be a discussion about feeder cattle moving inter-state. The most obvious problem initially was the timing. USDA provided only a few weeks notice before the first several meetings, and they were all scheduled in April and May, which is the busiest time of the year for many farmers and ranchers. Then, a week before the first meeting, USDA posted the supporting documents. The meeting handout hints that the underlying agenda is to begin pushing intra-state requirements and electronic forms of identification again – in other words, a NAIS-type system. (Read USDA’s supporting documents here and see pages 9 and 10 of the handout.) And check out the report from an attendee of the first meeting at http://farmandranchfreedom.org/wp-content/uploads/2017/04/ADT-Meeting-April-11-2017-Summary.pdf. It’s too expensive. The profit margins for most livestock producers are tiny. A NAIS-type program means not only buying RFID tags (which are more expensive than the traditional metal or plastic ones), but having the infrastructure to properly place the tags, read the tags, and manage the data. It doesn’t address animal disease. Traceability is part of being able to control and limit the spread of disease – but it does nothing to actually address disease. The real focus needs to be on prevention. If the government and industry spent even a fraction of the time that they have spent on NAIS on addressing overcrowding in feedlots, poor nutrition and the overuse of drugs, and preventing imports from countries with outbreaks, we would have far healthier animals and less risk of disease in this country. But those things cost the industry money and limit their international markets, so they’d rather focus on tagging and tracking animals. It’s about money. The real reason the industry players want electronic ID and tracking is to boost their own profits. The first time around, it was about exports to South Korea and Japan … because, with a 100% traceability program, exporters have greater leverage to claim that countries must open their borders to our products. This time, they’re talking about exporting to China. Not to mention the profits to be had from selling tens of millions of electronic tags, or from managing the massive databases that would be part of the system. Multiple companies and trade organizations stand to make a lot of money from the program – at the expense of the vast majority of farmers and ranchers. 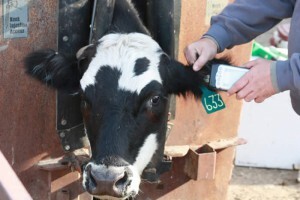 We don’t need every animal to have an electronic tag in its ear and its information entered in a database. What we need are programs that support independent producers, a vibrant competitive market, and healthy animal management to prevent disease. Unfortunately, it appears that we will have to fight this battle all over again, and we need your help to succeed! These meetings are at a bad time of the year for most producers to attend, we were given very little notice, and the agenda is clearly tilted towards pushing for a NAIS-type program. Given all of that, we do not urge people to drop everything and go to extreme lengths to attend. Part of winning a fight is knowing which battles to spend your energy on. However, it is useful to get our objections on the record so that USDA can’t claim they only heard from people who wanted an all-encompassing electronic ID program. So if one of the meetings is near enough that you can attend, please consider doing so. May 2: Embassy Suites Minneapolis Airport, 7901 34th Avenue South, Bloomington, MN. May 4: Doubletree by Hilton Denver, 3203 Quebec Street, Denver, CO.
May 11: Sacramento Marriott Rancho Cordova, 11211 Point East Drive, Rancho Cordova, CA. May 24: Hilton Garden Inn Billings, 2465 Grant Road, Billings, MT. You can register for the meeting at www.aphis.usda.gov/animal-health/adt-meeting-registrations. 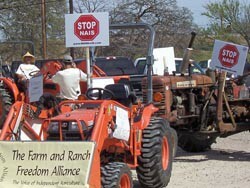 Please also email Judith@FarmAndRanchFreedom.org so that we can coordinate with you. I request an extension of time for written comments, until July 31, 2017. This is the busiest time of year for many ranchers, including myself because __________. I need more time to review the USDA documents and consider the issues carefully. My initial comments are that any action by USDA should be limited to the question of whether feeder cattle should be required to be identified when crossing state lines. That is the issue that USDA committed to reviewing when it adopted ADT just a few years ago.